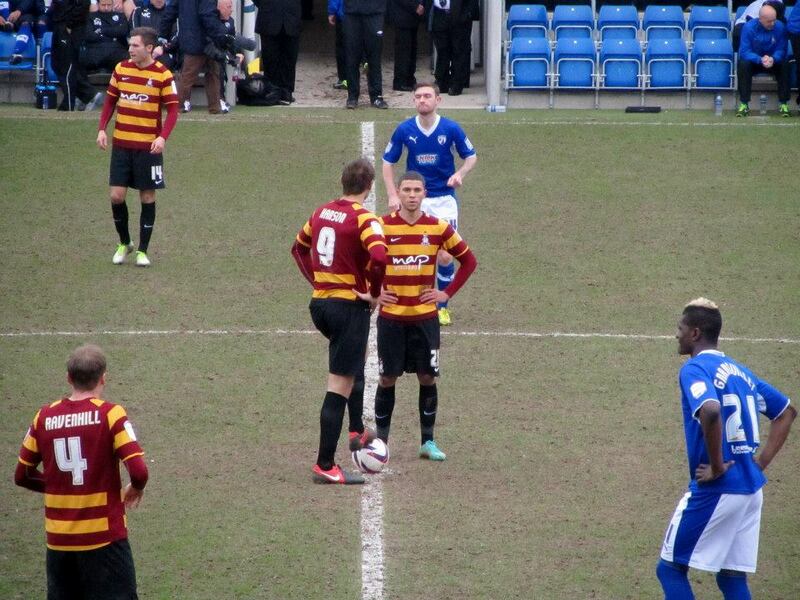 This game was of huge importance for both sides as they pushed for a play off place. 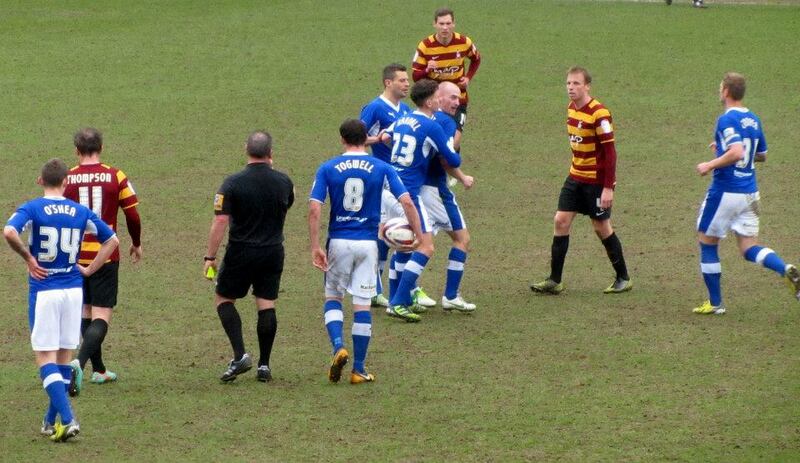 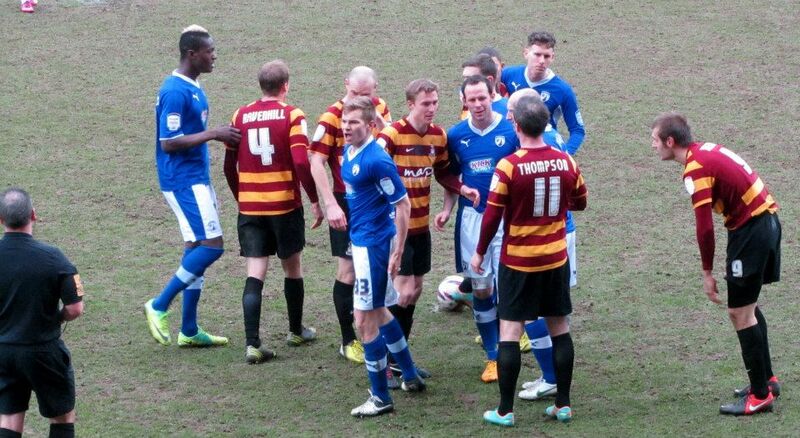 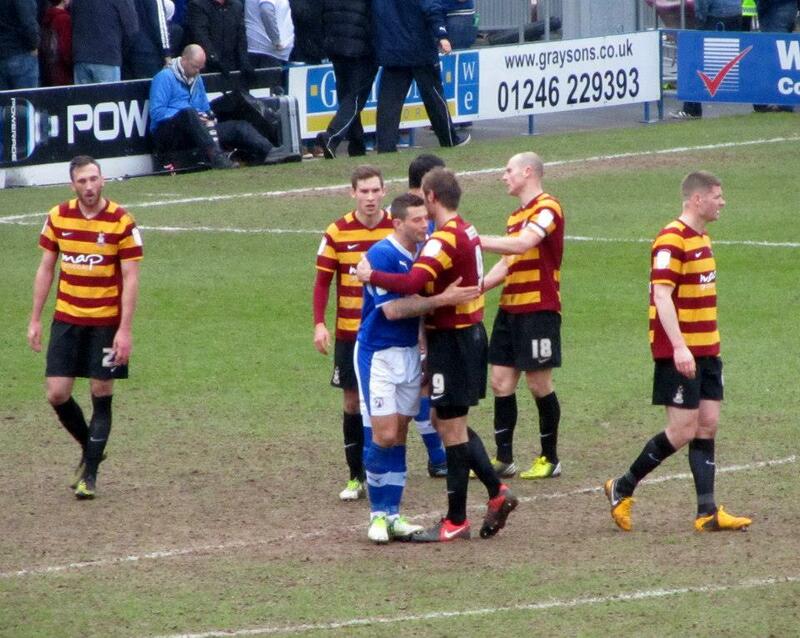 Bradford sat in 7th, having won their last three games, while the Spireites were four points adrift in 9th place. 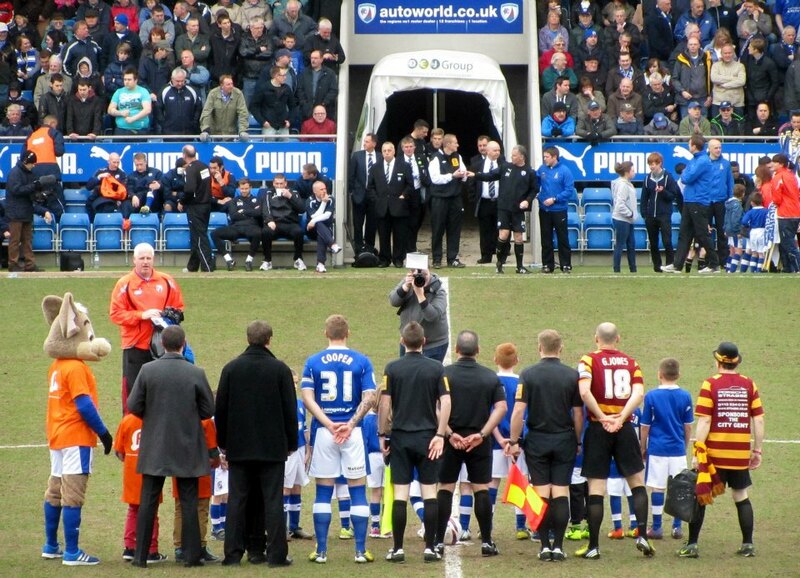 However, a victory for Chesterfield would leave them just 1 point behind the top seven and after a rather inconsistent season, the once unlikely dream of the play offs now looked a real possibility. 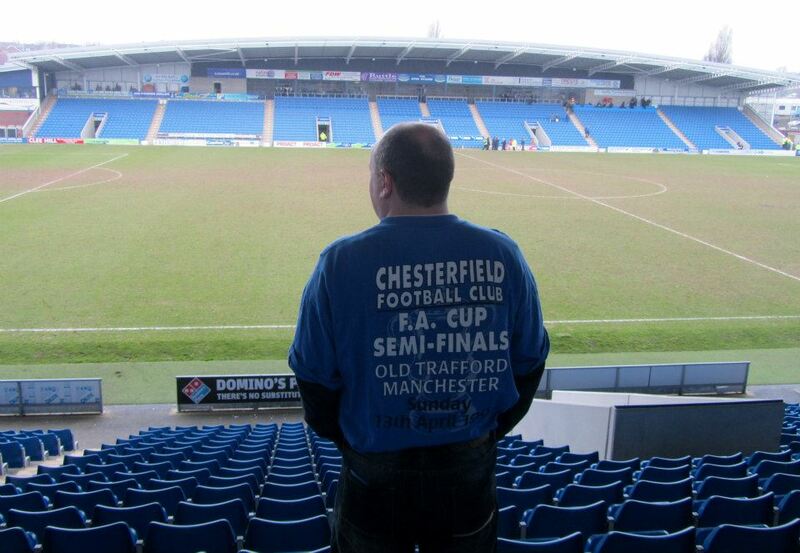 Today was also the 16th anniversary of Chesterfield’s FA Cup Semi Final against Middlesbrough at Old Trafford. 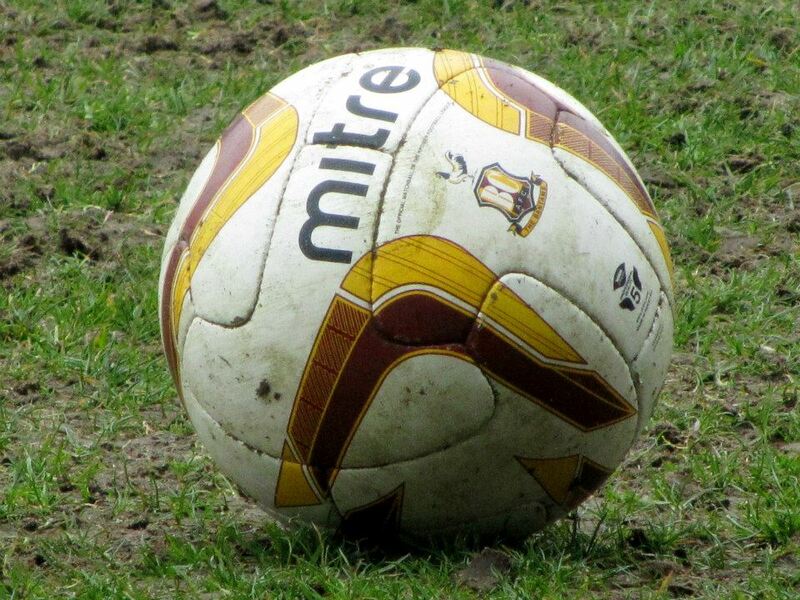 On this day in 1997, the Spireites earned a dramatic 3-3 draw against Boro with a stoppage time equaliser from the current physio Jamie Hewitt, having previously seen off the likes of Nottingham Forest and Bolton Wanderers. 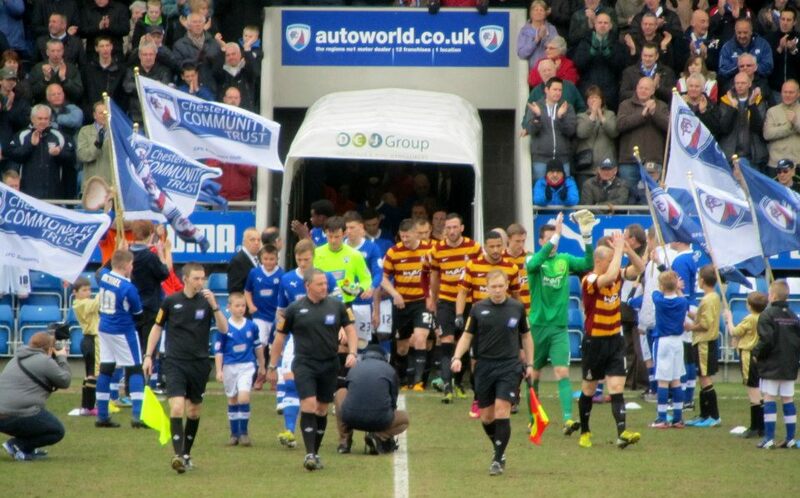 Supporters were encouraged to wear their commemorative shirts from the day and my Dad did just that, having been to both the semi final and the replay at Hillsborough where the Spireites were defeated 3-0. 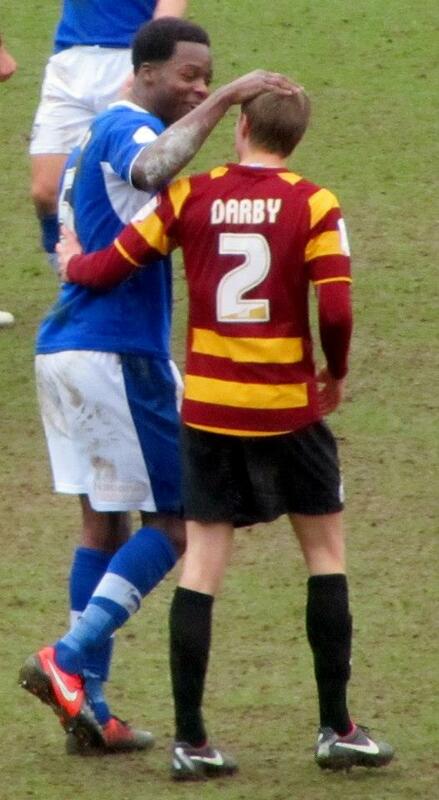 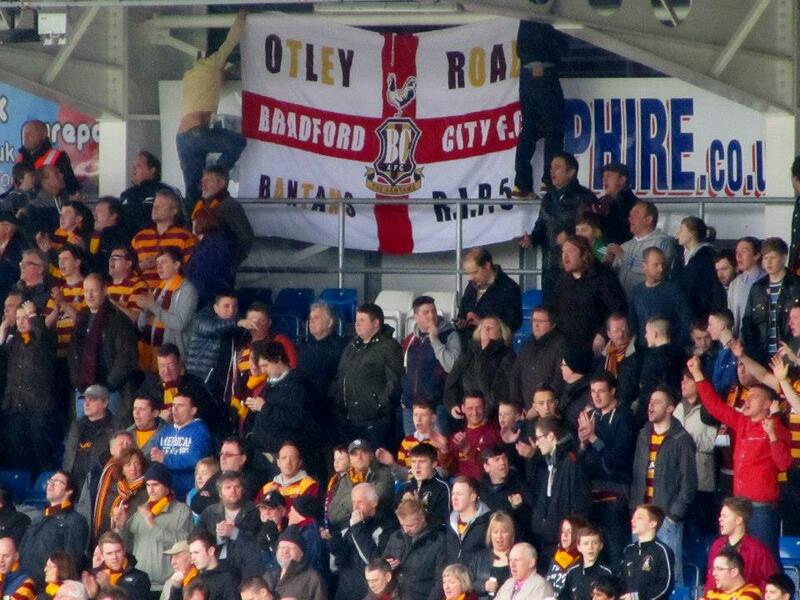 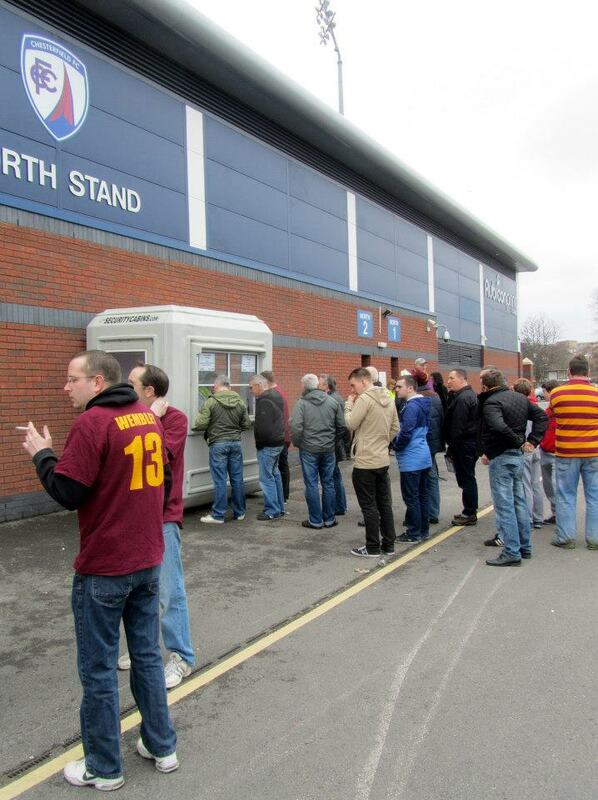 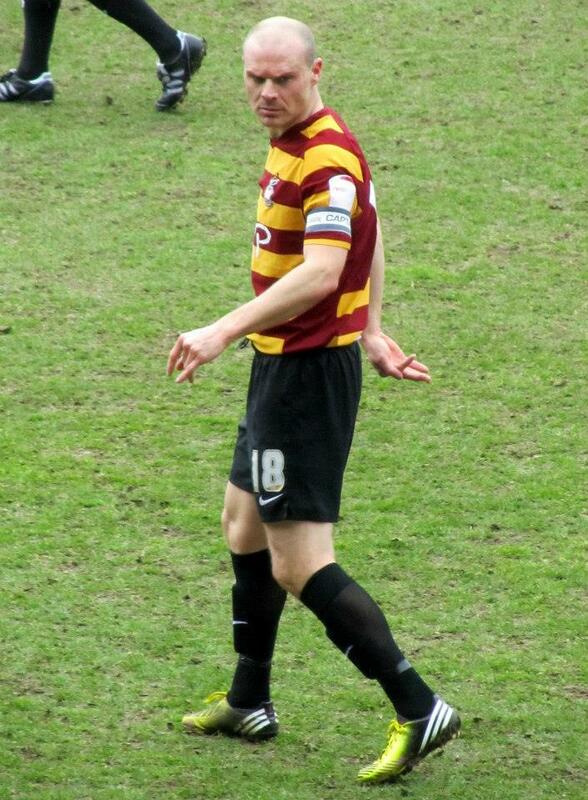 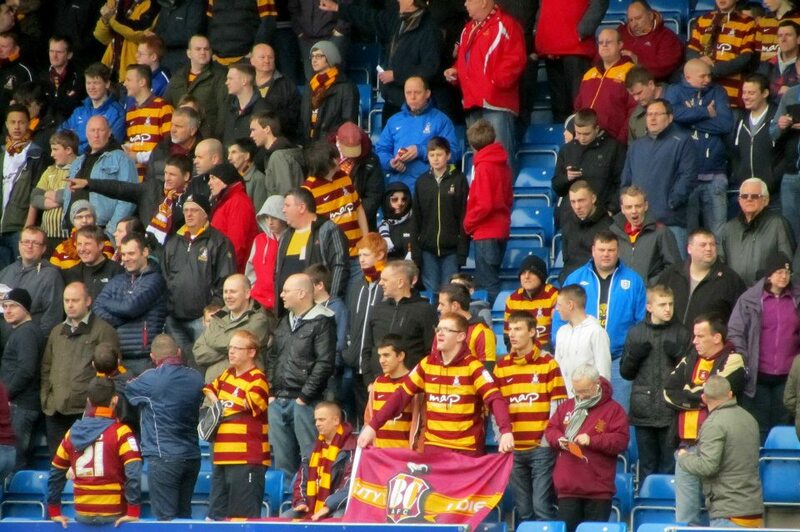 Today’s visitors Bradford City has of course had their own cup fairytale this season in the League Cup. 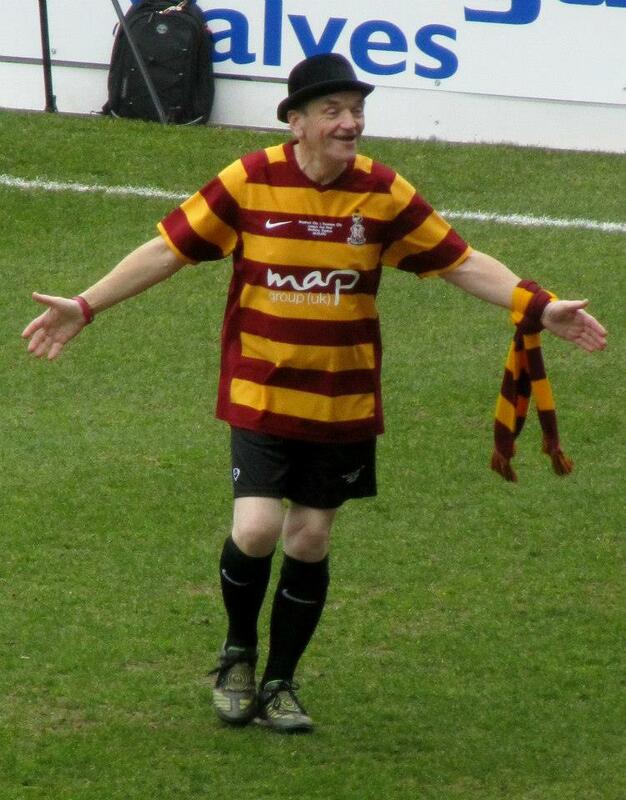 After knocking out Wigan Athletic and Arsenal, the Bantams then remarkably beat Aston Villa, a third Premiership side, in the semi final over two legs to become the first fourth tier side in history to reach a major domestic Wembley cup final. 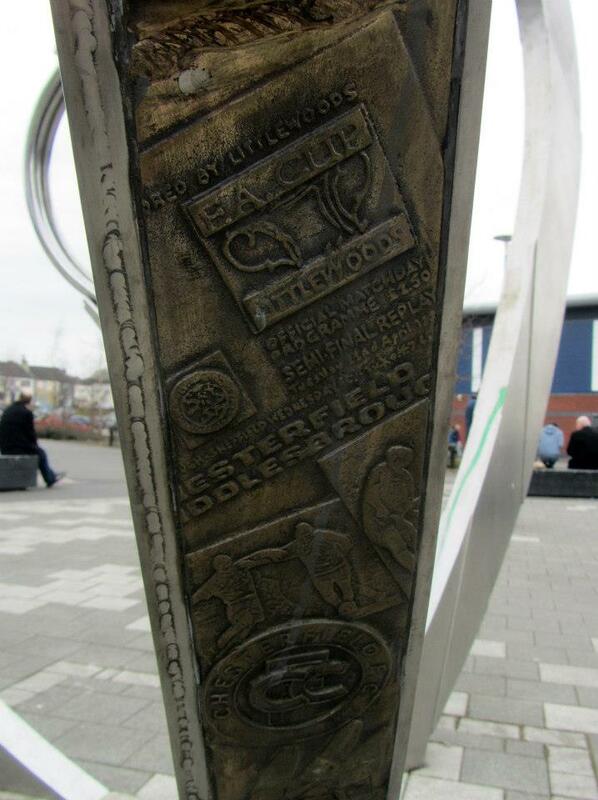 They came unstuck in the final, falling to a 5-0 defeat at the hands of Swansea City, but despite this it was still a remarkable achievement for the club. 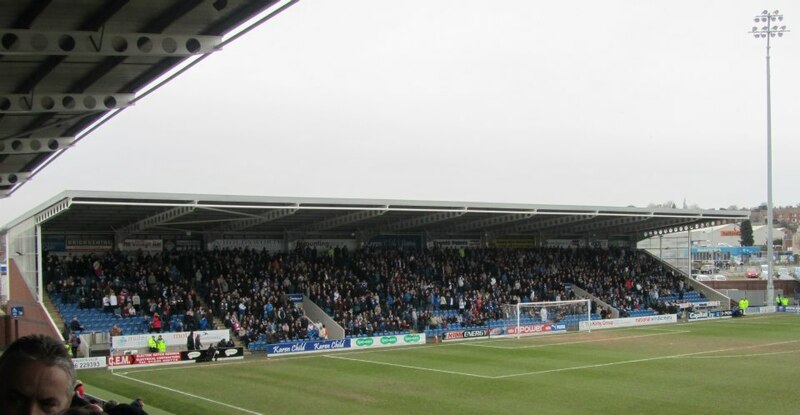 For today’s huge game, Chesterfield manager Paul Cook made two changes to the side that had won 2-0 at Barnet last week. 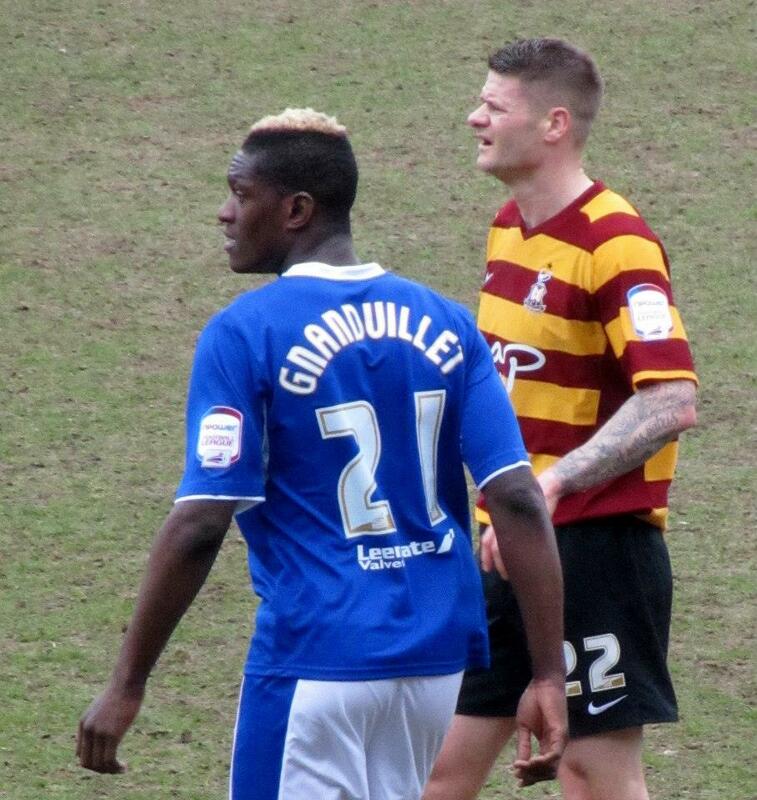 Armand Gnanduillet and Richard Brindley both returned to the staring eleven after neither player travelled to London, taking the places of Danny Whitaker and Scott Boden. 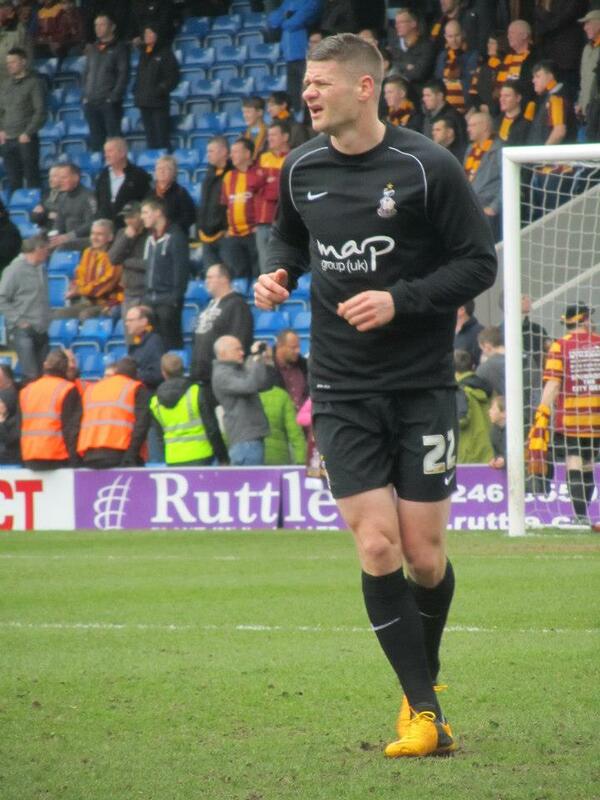 Meanwhile, there was just a single change made to the Bradford City line up by Phil Parkinson with Michael Nelson replacing Andrew Davies. 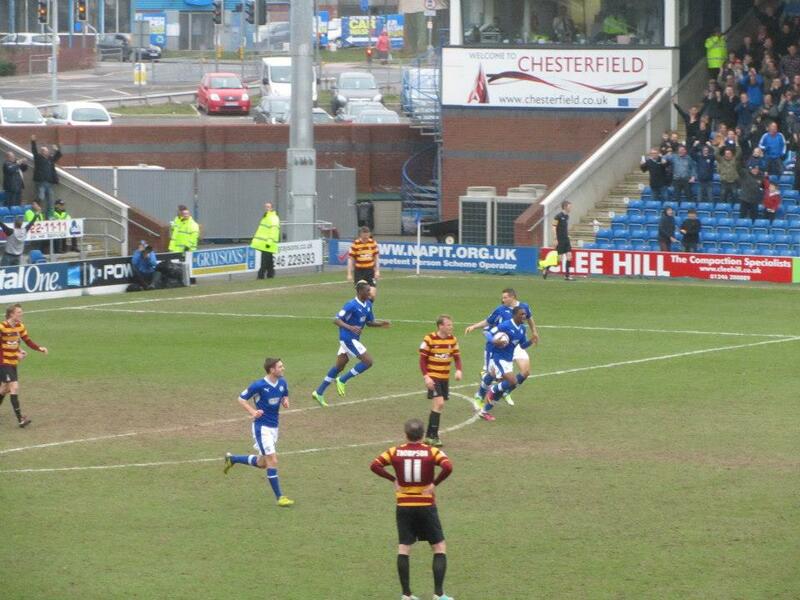 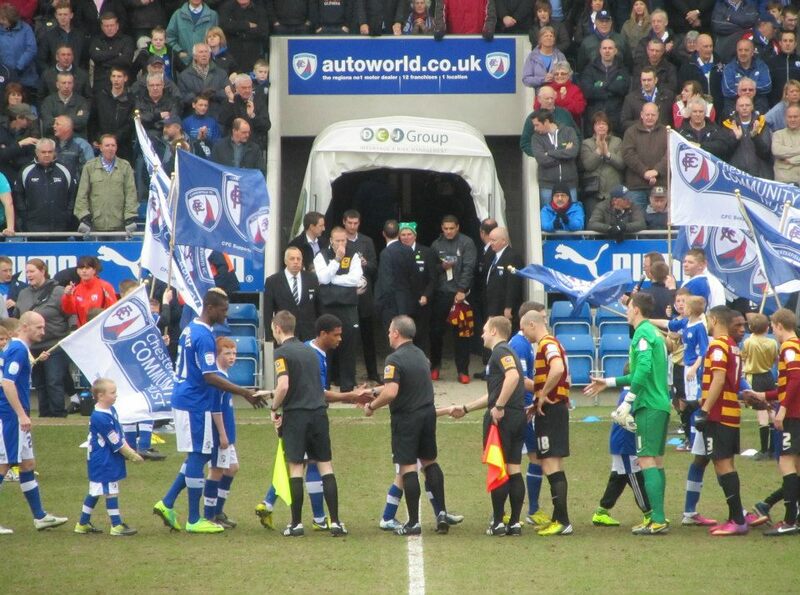 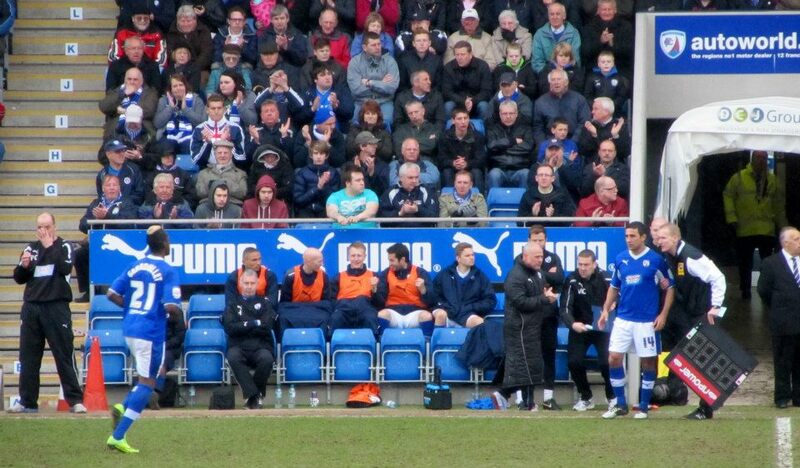 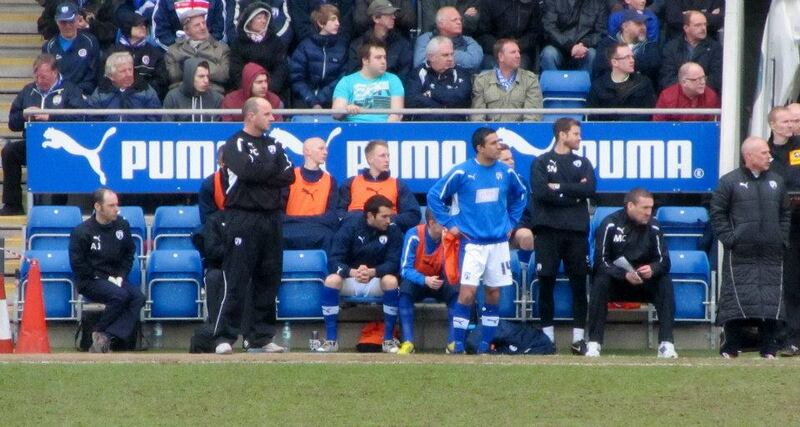 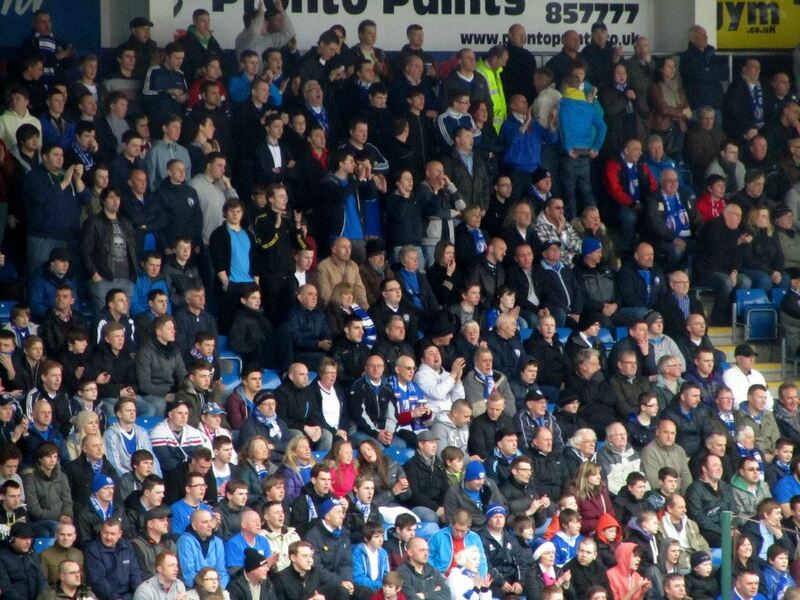 Chesterfield started the stronger as they attacked towards the noisy away end. 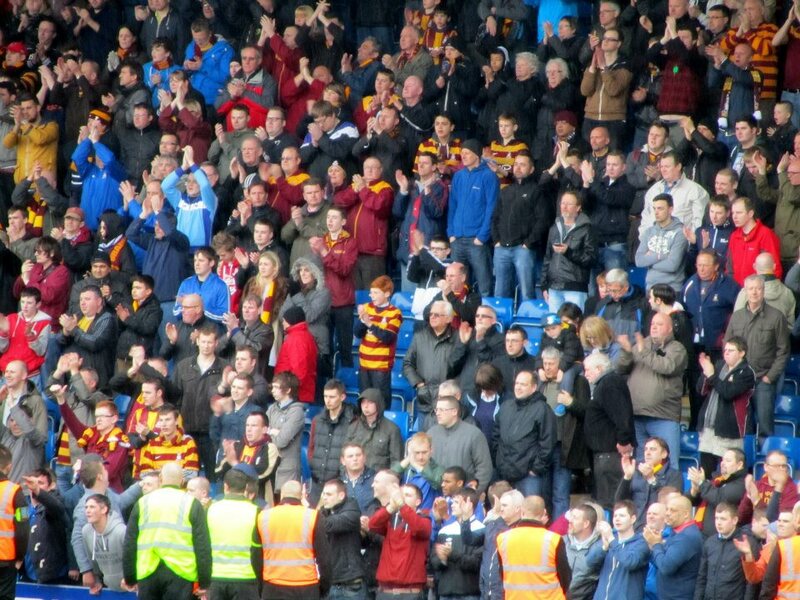 They came agonisingly close to taking the lead early on when a goalmouth scramble led to the ball being cleared off the line by Bantams captain Gary Jones. 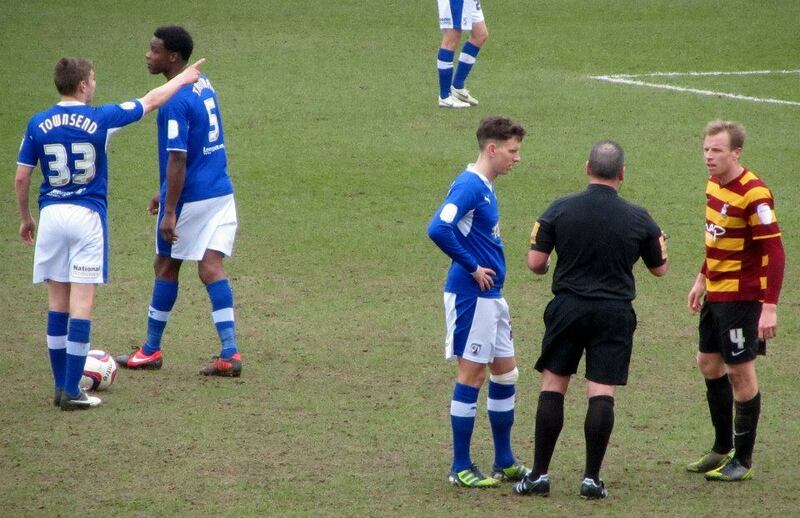 After having plenty of possession without creating many clear-cut chances, a golden opportunity finally arrived when Jay O’Shea played Tendayi Darikwa through on goal. 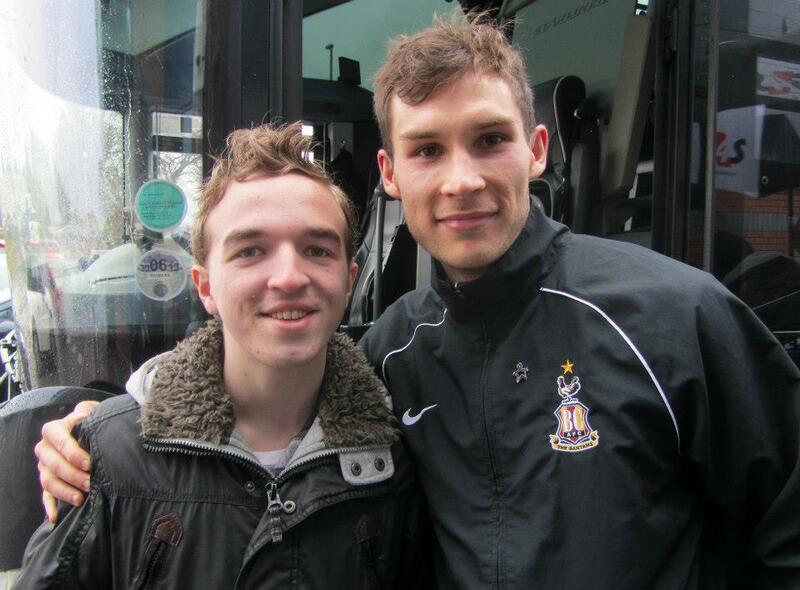 However, the youngster fired straight at the on-rushing Jon McLaughlin, who had little difficulty in saving the strike. 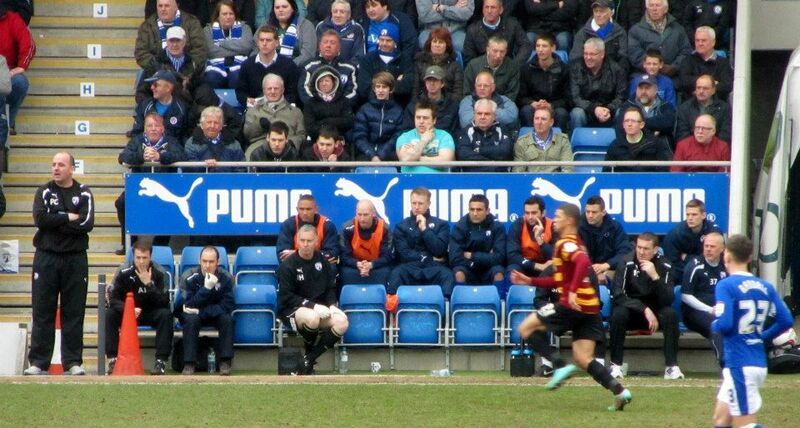 Just moments later, the Spireites were made to pay for these missed opportunities as Nahki Wells put the visitors in front with his 22nd goal of the season. 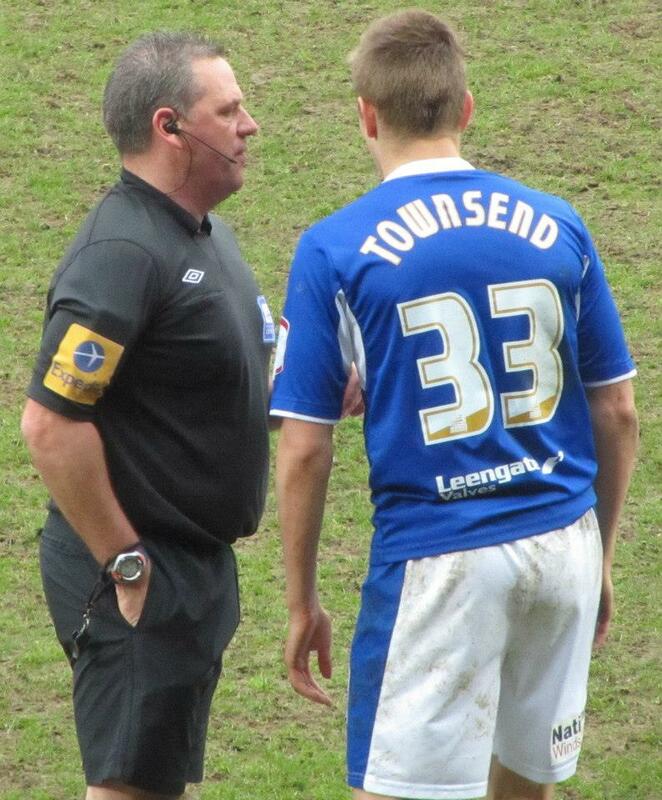 James Hanson found Wells who fired a shot into the bottom corner which left Tommy Lee with no chance. 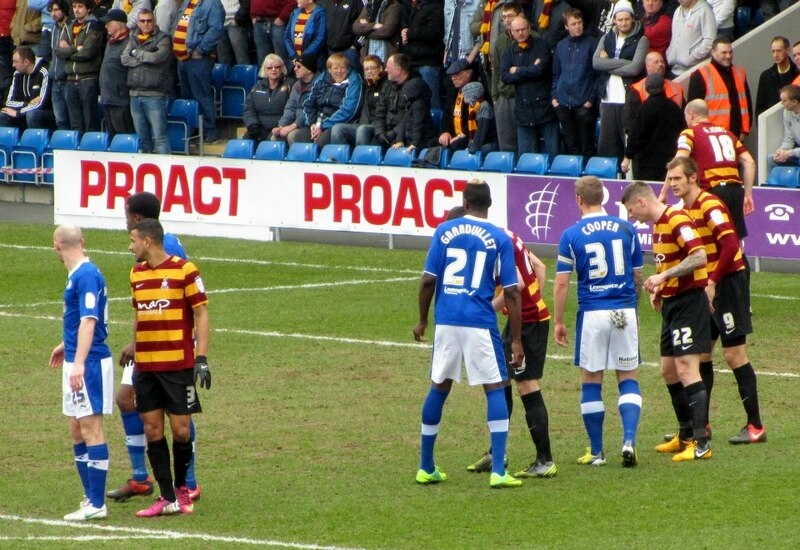 After controlling much of the opening 45 minutes, the Spireites struggled to find their feet in the second half as Bradford looked to push on and further their advantage. 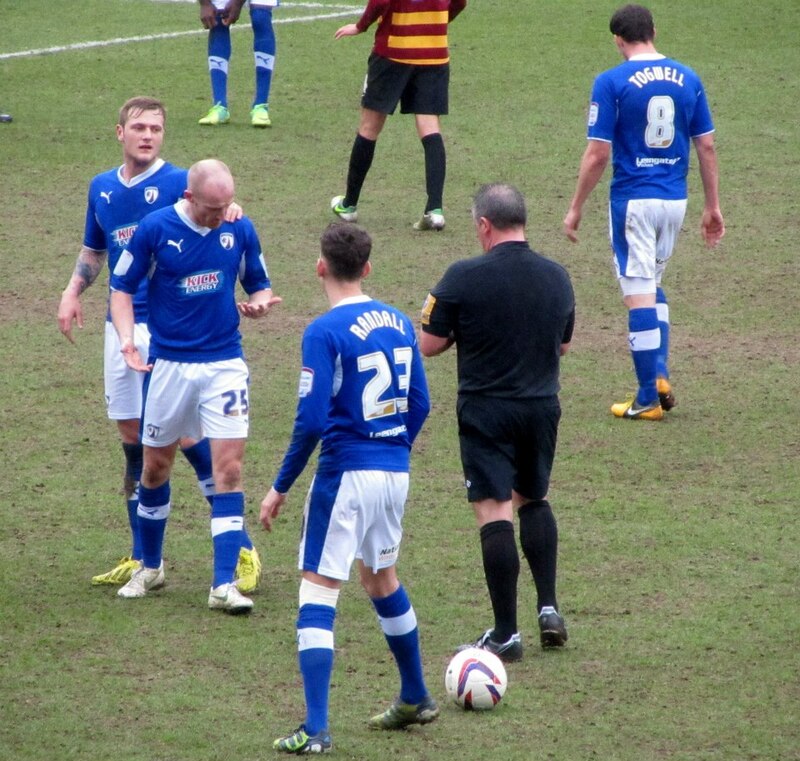 Chesterfield desperately needed to get something from this game if they wanted to keep their play-off hopes alive and Paul Cook clearly recognised this as he decided to switch to a more attacking 4-4-2 formation with Marc Richards replacing Conor Townsend. 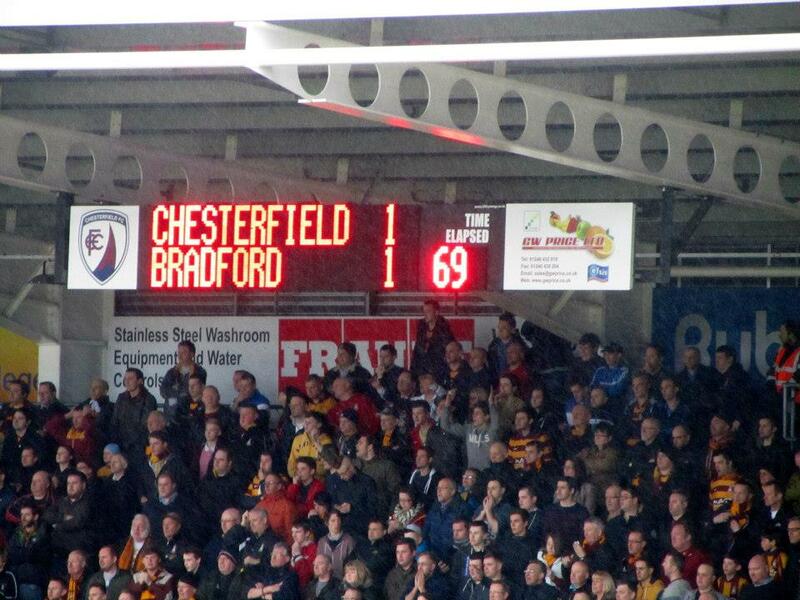 And with 20 minutes to go, it was all to play for as the scores were levelled. 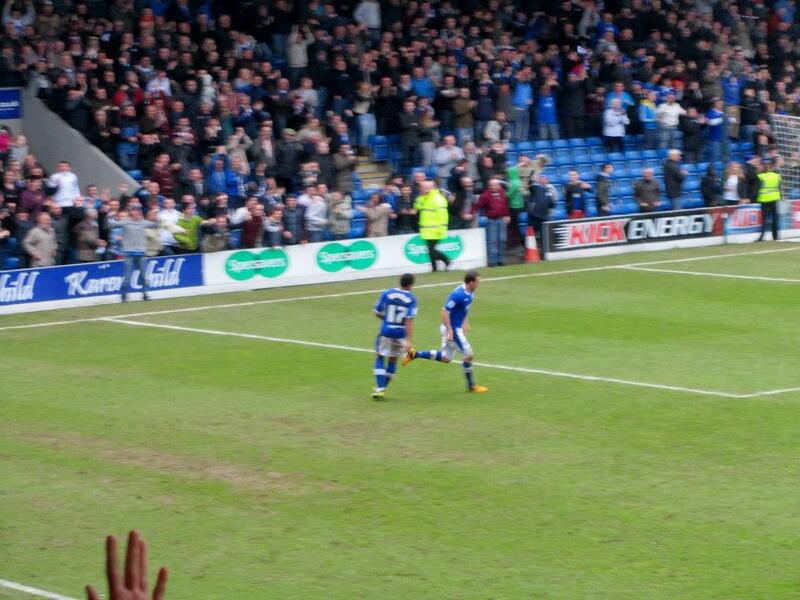 Darikwa made up for his earlier missed chance by getting on the end of Richards’ low cross and firing the ball home to set up an exciting finish. 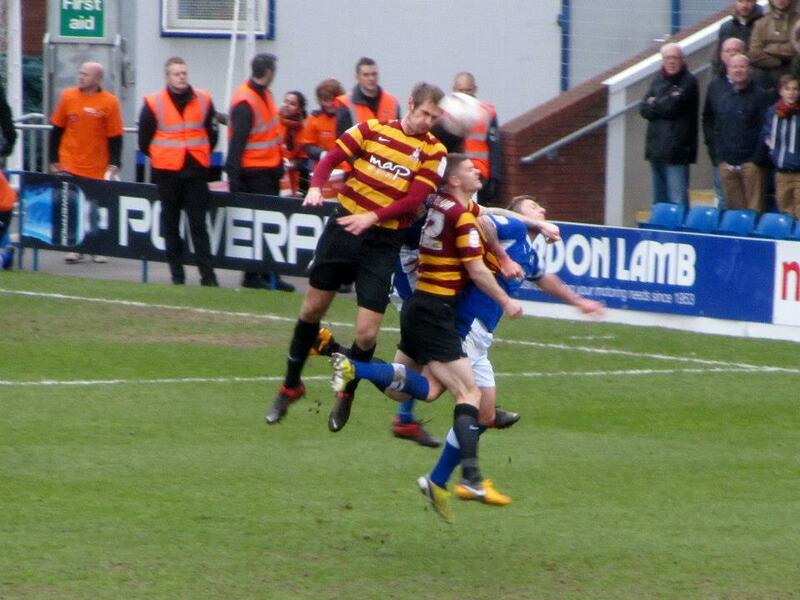 But just 9 minutes later and the Bantams were ahead again courtesy of a Ricky Ravenhill effort. 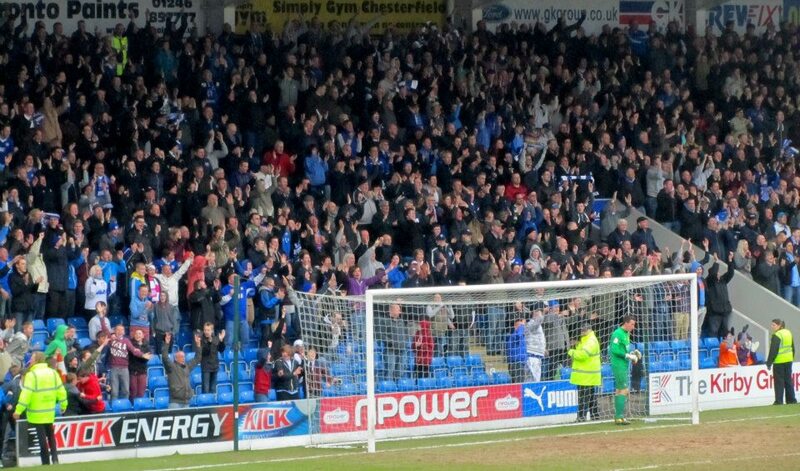 A corner was punched away by Lee but it fell straight to Ravenhill, who fired a low shot past a group of players and into the net to send the away end crazy. 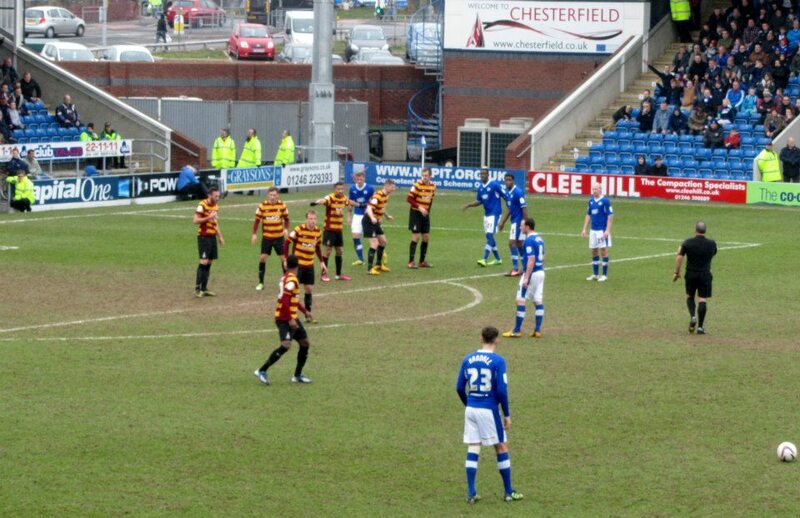 Jack Lester was brought on to replace Armand Gnanduillet as a last role of the dice by the Chesterfield boss, but as the minutes ticked away it look like their season was all but mathematically over. 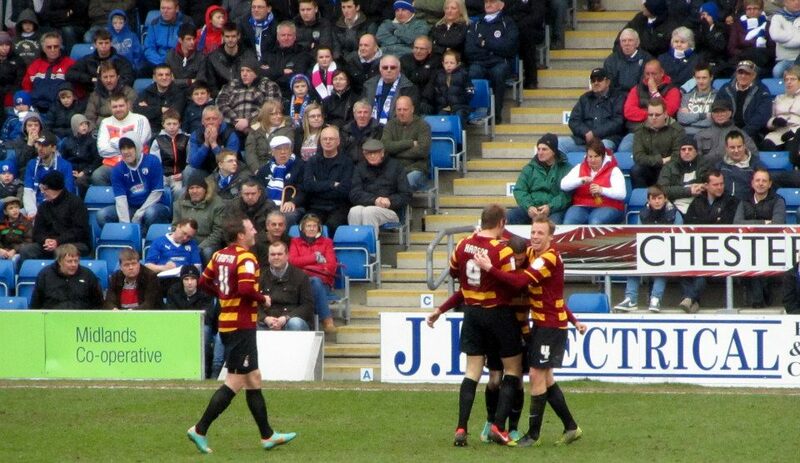 However, in the third minute of stoppage time Same Togwell salvaged a point for the home side. 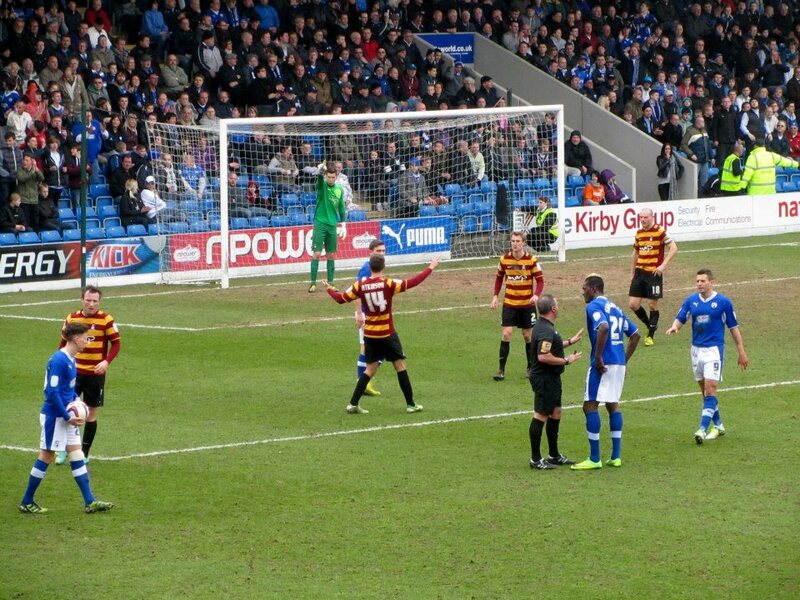 A corner was flicked on at the near post and found Togwell, who had the simplest of tasks as he tapped the ball in to the net from just yards out. 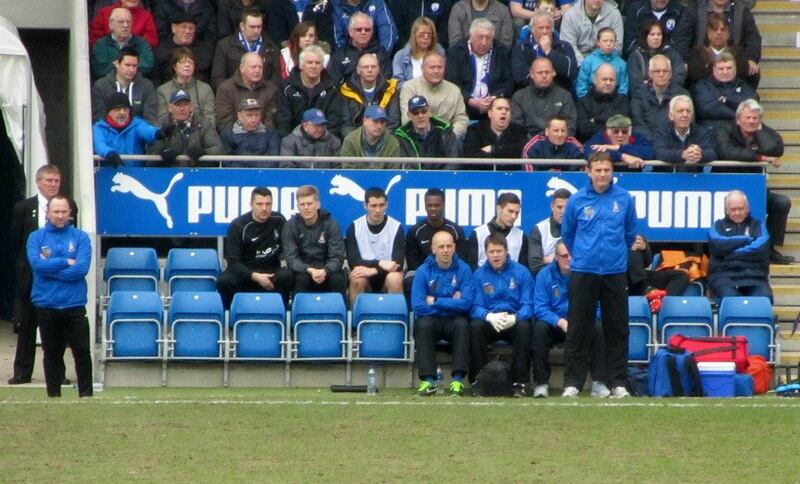 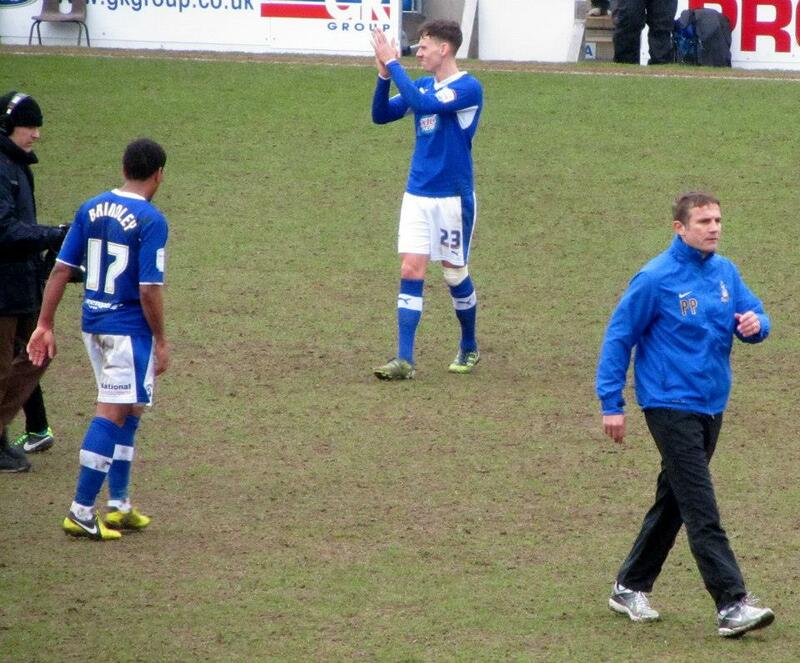 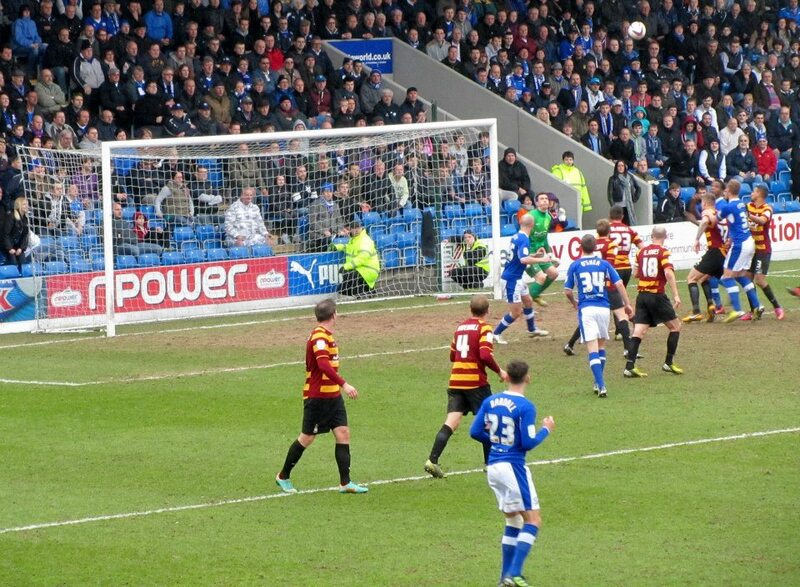 The goal kept Chesterfield’s slim chances of the play offs alive for another day. 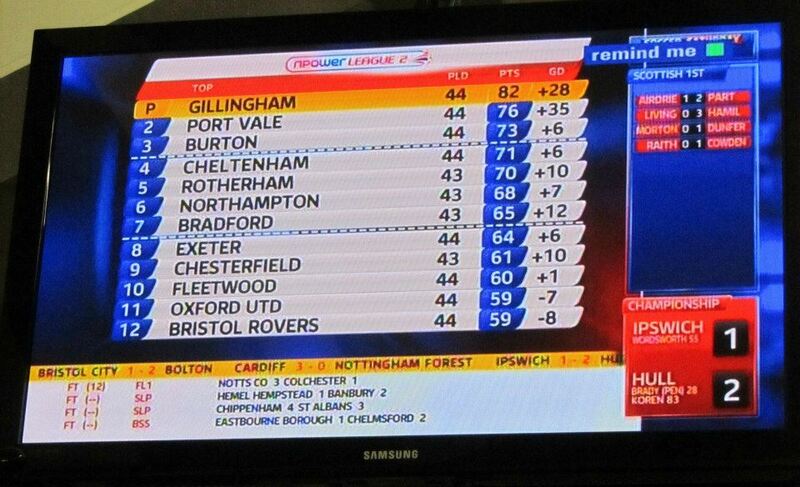 The Spireites remain in 9th position, 4 points off the play off spots, with just three games to go but it is not yet beyond the realm of possibility. 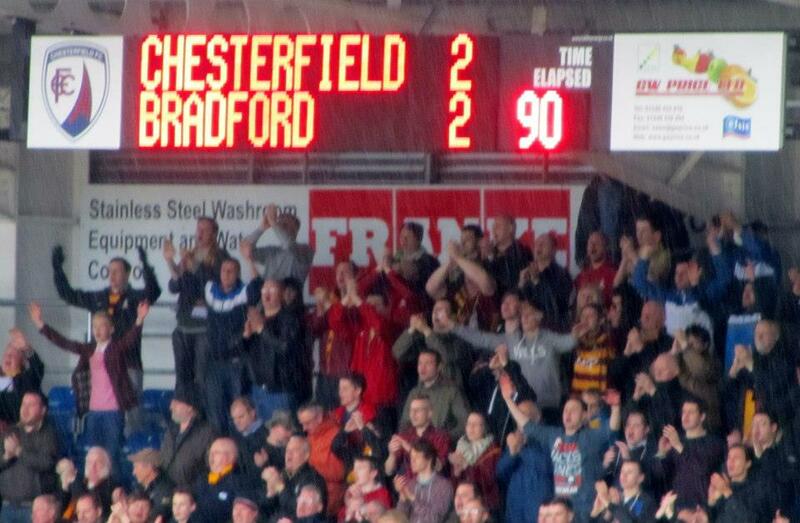 The Bantams also remained in 7th, just a point ahead of 8th placed Exeter City but with a game in hand. 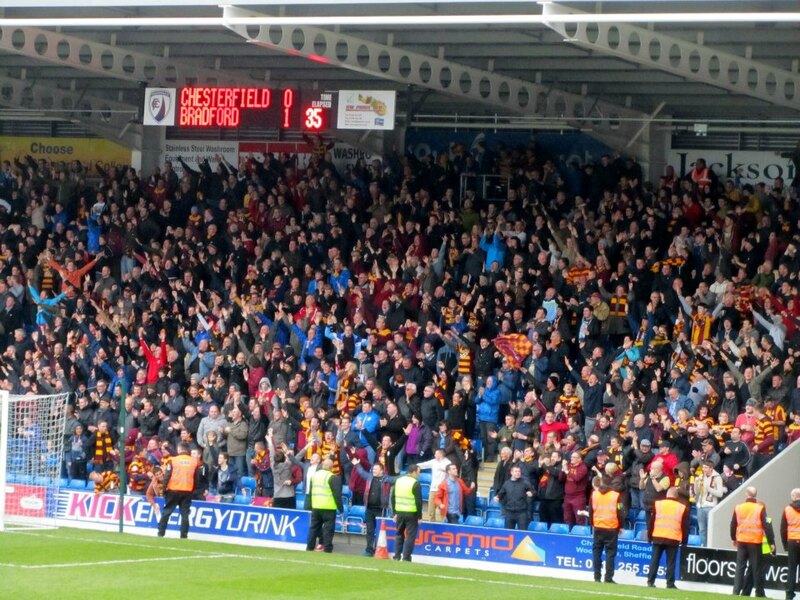 It is sure to be a tense battle for the final play off spot and Tuesday’s games for Chesterfield and Bradford, against Plymouth and Rotherham respectively, are vital and could make all the difference. 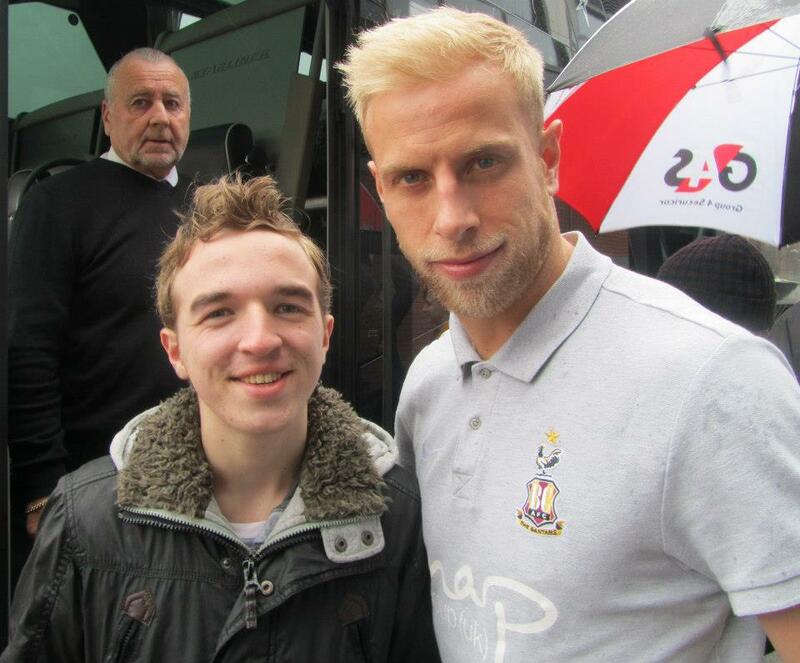 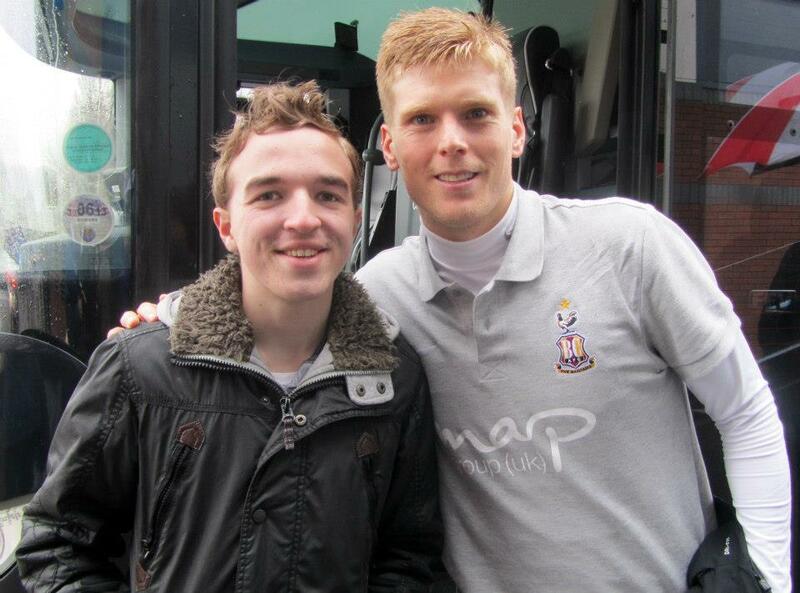 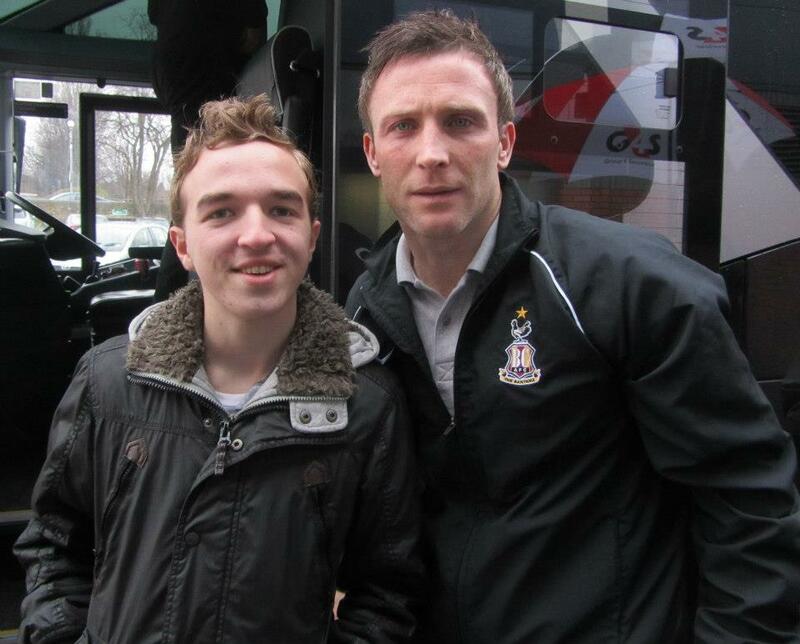 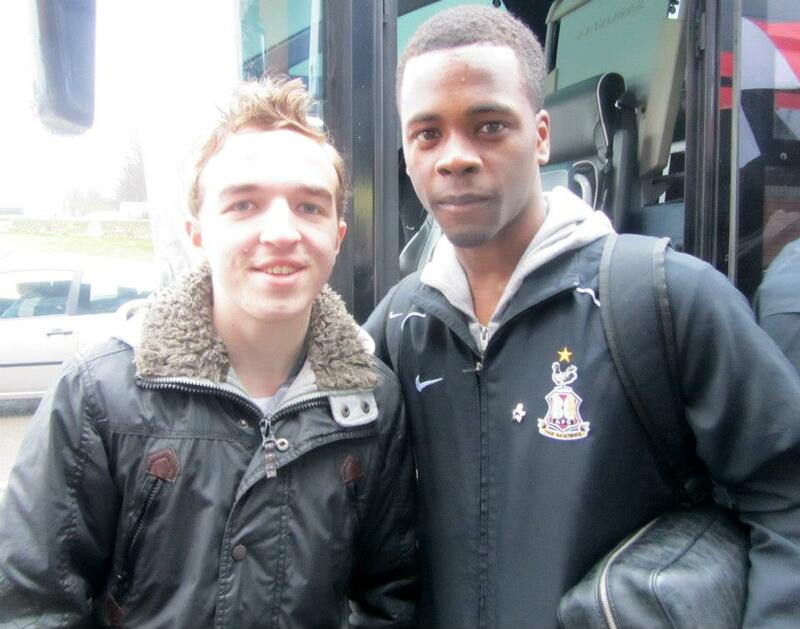 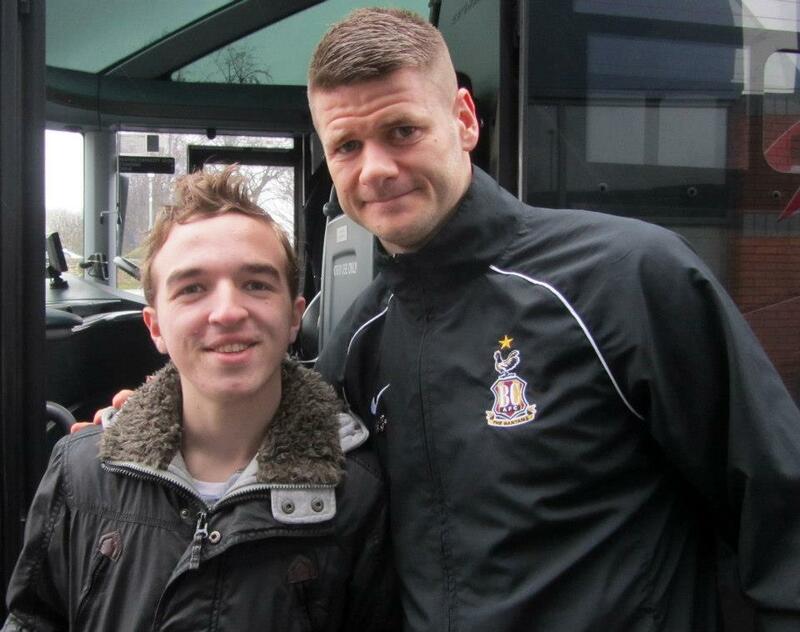 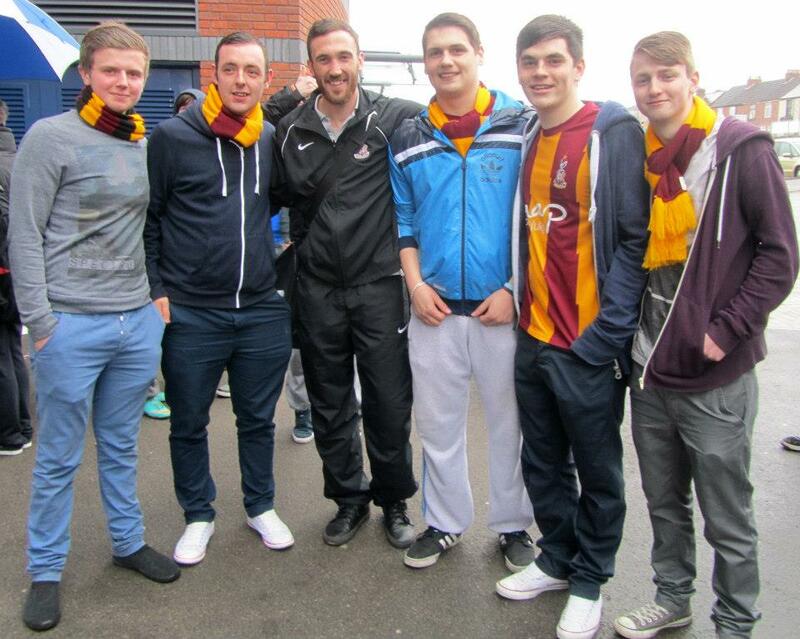 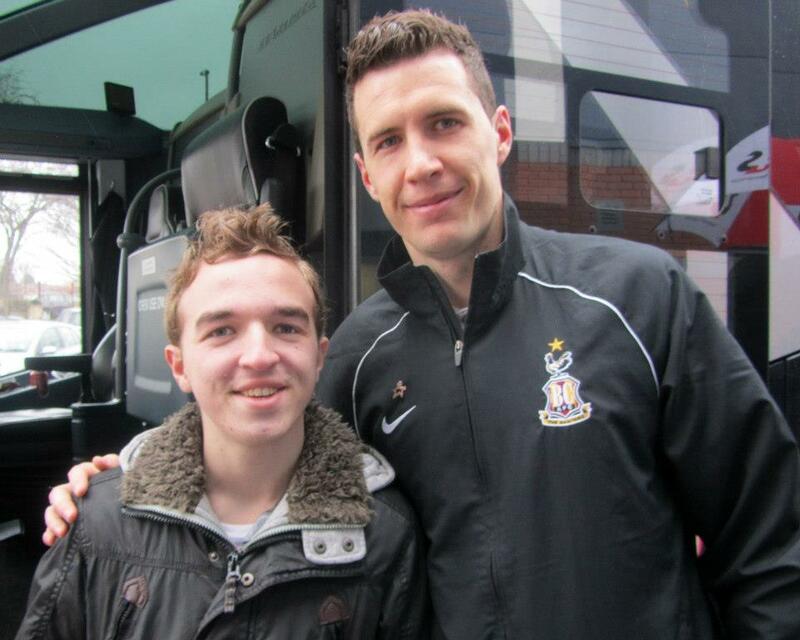 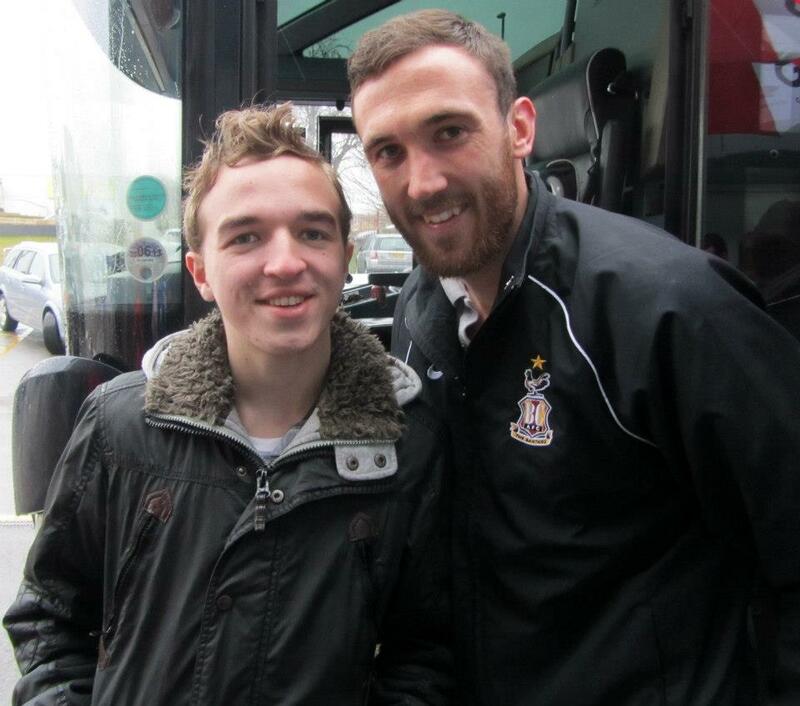 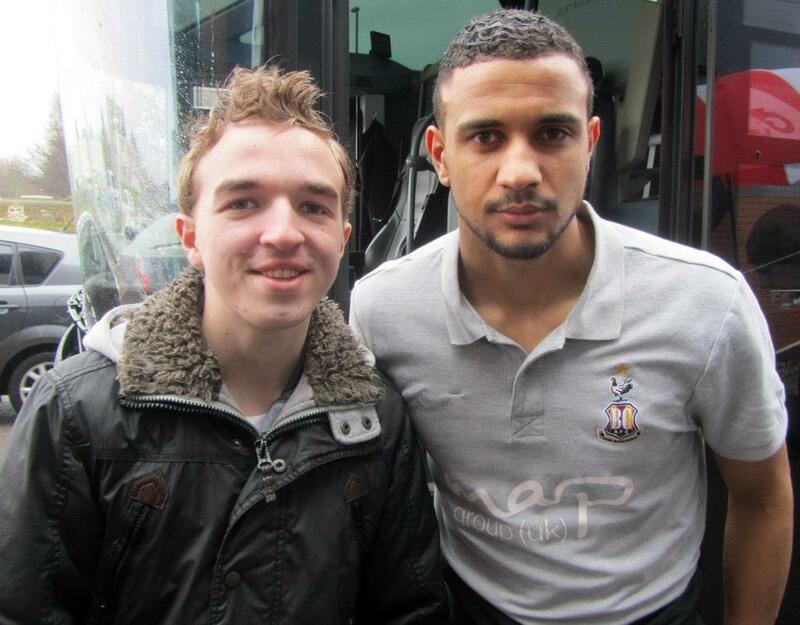 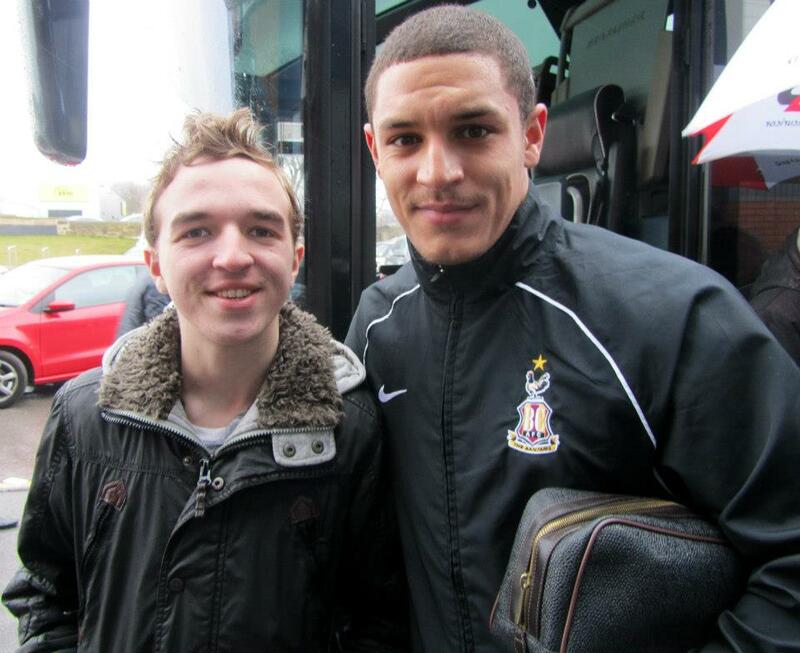 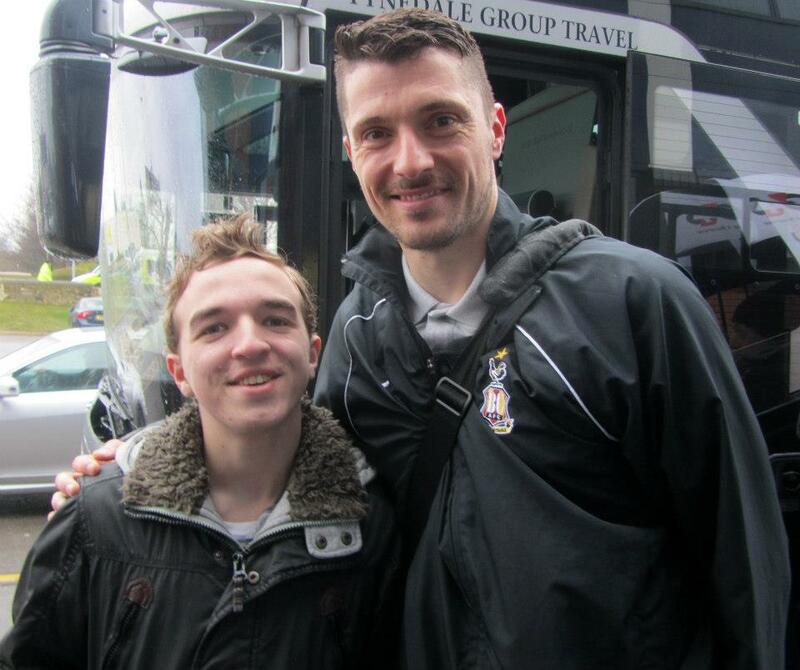 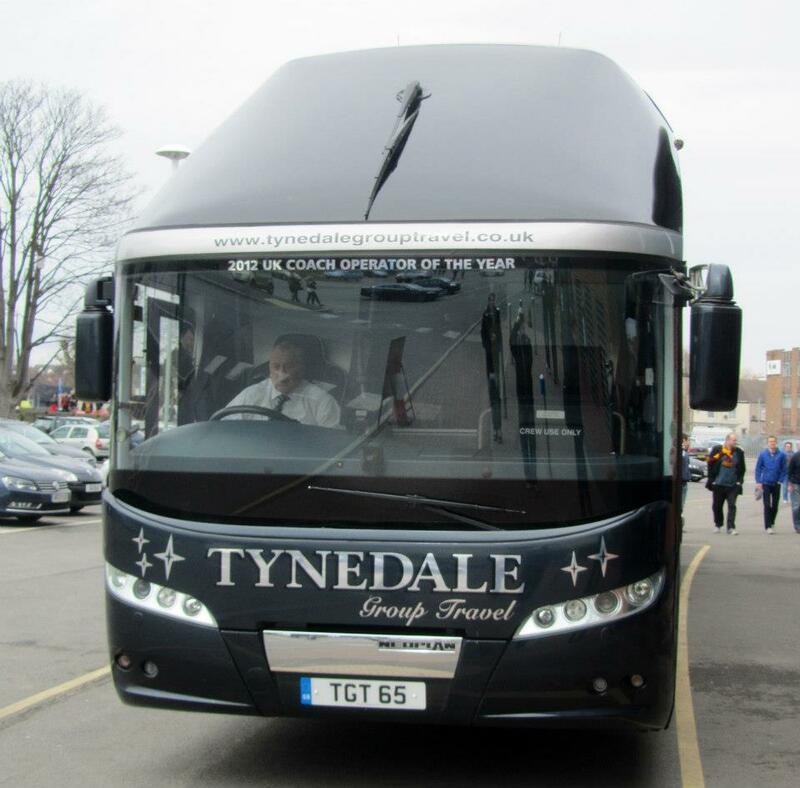 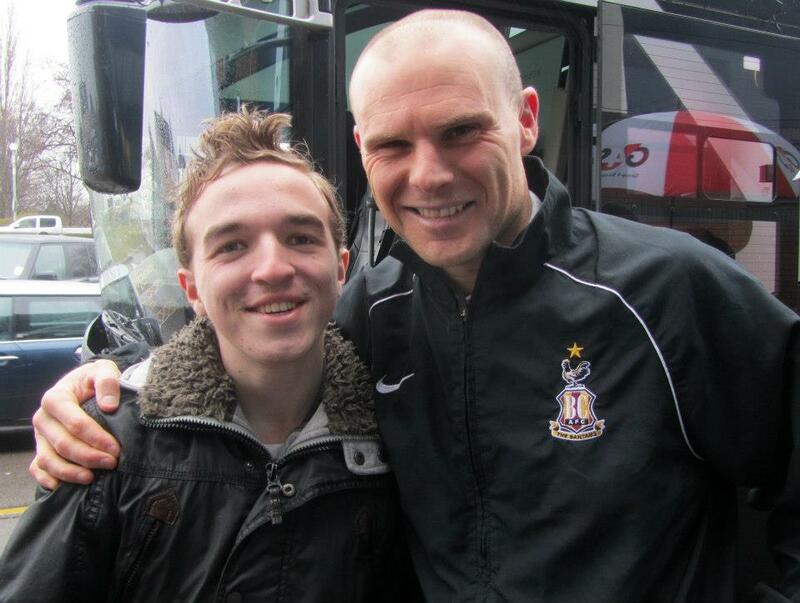 After the game, I met some of the Bradford City players as they made their way to the coach. 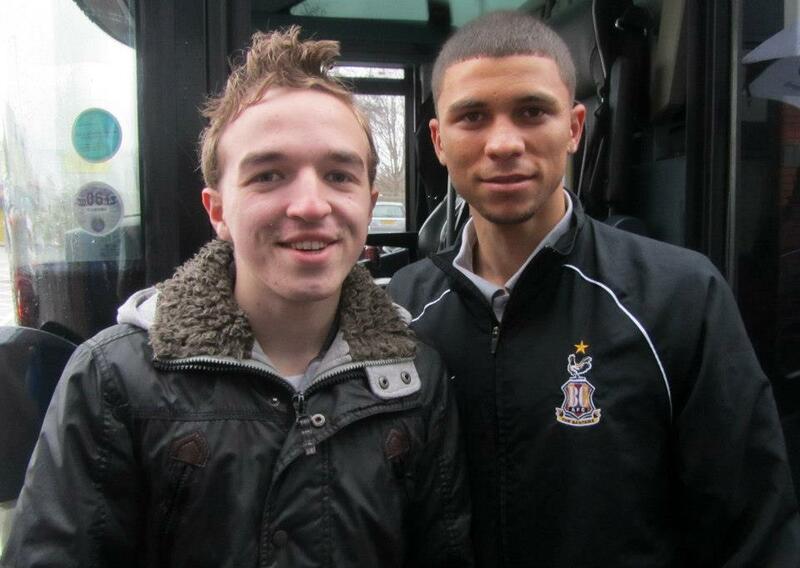 I got photos with goalscorer Nahki Wells, captain Gary Jones and the heroes of the League Cup run Matt Duke and James Hanson as well as 8 of the starting 11 from the final at Wembley in February.